As New Year’s Eve approaches we think ahead to our new calendars. Earlier this month, the Lord Mayor of Cork launched the Cork Three Faiths Forum 2018 Interfaith Calendar. Members of the Cork Three Faiths Forum were welcomed to the Lord Mayor’s Parlour at City Hall on Wednesday 14th December for the launch. The Lord Mayor fo Cork, Cllr Tony Fitzgerald, launched the Cork Three Faiths Forum 2018 Calendar earlier this month. The ​Cork Three Faiths Forum has been meeting since May 2016. It ​brings together members of the three Abrahamic faiths – Judaism, Christianity and Islam – and seeks to create a space where people of faith can dialogue openly and respectfully, come to a better understanding of each other’s faith, and work together to enhance tolerance, cooperation and friendship in society. 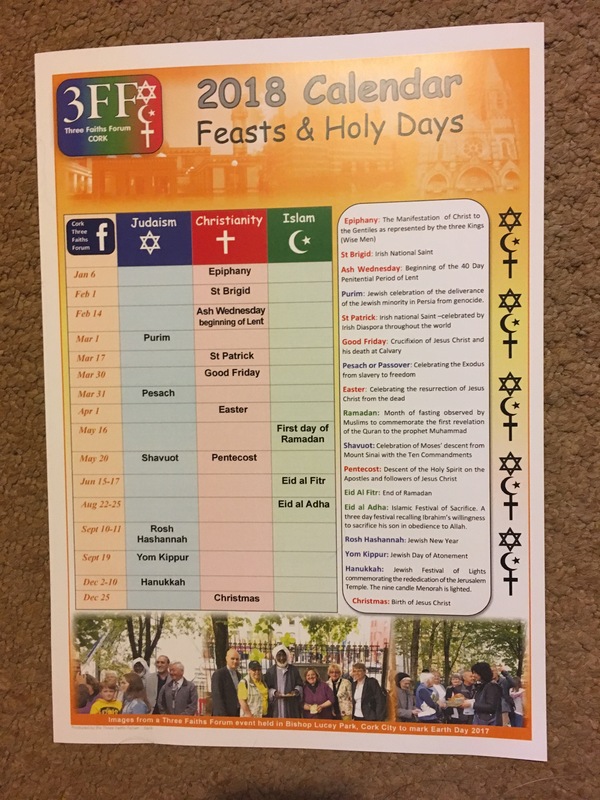 This entry was posted in Church in Society, Community Involvement, Cork, Cork Three Faiths Forum, Diocese, Interfaith Dialogue, Lord Mayor of Cork. Bookmark the permalink.